This Saturday is the annual Halloween Party! It will be held in the first floor of Baker (Building 180). Trivia is a quiz competition similar to Jeopardy, with categories of related questions ranging from 100 to 500. In each round, eight players will be given buzzers and the first person to buzz in and answer a question correctly will will earn the respective amount of points. If a player gets the question wrong, they will lose that amount of points and the players will be able to answer the question. The contestent that answers a question will choose the next question until all the questions on the board are cleared. Each round will contain two boards of categories. Like in Trivia, each of the eight contestants will be given a buzzer. The screen will show a picture of an anime character, and the contestants must compete to see who can buzz in first and name the character. The catch, of course, is that the picture starts out incredibly pixelated, gaining clarity as time goes on. The earlier you buzz in, the more points you can earn by giving the correct answer. However, giving a wrong answer will cause you to lose just as many points. After each set of pictures has been gone through, the winner will be whoever has the highest point count. Keep in mind, you must actually give the character’s name, so answers like “the main character of Cowboy Bebop” won’t get you points. Both Trivia and Eyes will have three preliminary rounds, which act as qualifiers for the Finals. The top players from the first three rounds will be entered into Finals. If you are a paid member of the club and you win Finals, then you’ll get a prize! During Eyes and Trivia, the game room will be open for anyone to bring in board or video games. If you aren’t interested in Eyes and Trivia, feel free to play your own games here (although we won’t be giving out prizes for them). After Eyes and Trivia wrap up, the game room will be used to host a video game tournament, with the winner (if they’re a paid member) receiving a prize. We won’t reveal the game that we’re playing until the event, but it’s meant to be a game which will not excessively favor those who are familiar with it. So even if you aren’t a master gamer, you’ll still have a shot at the prize, and a guarantee of fun. While the other events are going on, we have scheduled some panels for people to attend if they are interested in the topics being covered. Each of these panels is being run by one of the club’s officers, relating to a topic they’re interested in. We scheduled them so that attending will not force you to miss out on the competitive events, so if you’re interested in what’s being talked about, come on by. After the conclusion of the Video Game tournament, we will have a bit of downtime to allow everyone to eat dinner. For convenience, we will be selling pizza during dinner, and soda will be available for purchase throughout the day. While everyone is eating their dinner, a round of Officer Trivia will be held for the amusement of onlookers. Officer Trivia is structured just like regular Trivia, but it is the officers who are competing, with Trivia questions made by former officers or alumni. The questions in Officer Trivia are generally unfair and cruel, so it’s amusing to watch. Within this hyperlink, the officers have created a list of categories, along with the rules for our Scavenger Hunt. Entries for the Scavenger Hunt must be submitted to the officers by the Thursday, the 24th. The idea for this competition is to take a picture (or pictures) that fit one (or multiple) of the categories. Whether they are literal, comedic, or ironic interpretations of the category, we’ll be judging based on the cleverness and creativity of the entry. During Halloween Party, the submissions the officers found to be the best will be shown, and one will be chosen to win a prize. Through the linked form, competitors may submit anime-related art or pumpkin art for entry into this contest. Submissions can also be brought as a photo, drawing, pumpkin, or other form of art, to Halloween Party to be showcased, and the audience will vote for which entry they believe is the best, which will receive a prize. Either show up or change into your cosplay in time for the competition, and the audience will once again vote for which competitor they think deserves the prize. Cosplay is not required to be from an anime (many past competitors have donned video game cosplays), but voters are more likely to vote for things they recognize, and our club is focused on anime. After all of the competitions have concluded, the officers will spend a brief period analyzing and calculating the results. During this time, we will have our Anime Credits segment run. This segment allows attendees to request anime OPs and EDs to be played, and we have tried to amass a sizable collection to ensure that we’re prepared for what you throw at us. Once the officers have finished deliberating, they will return to announce the winners of the Halloween Party’s many awards. In addition to the prizes for each individual event, there will be grand prizes awarded to those who did well in multiple events throughout the Party. A single person cannot get multiple awards, so you’ll only receive the most valuable award you earned. This means that runners-up in many competitions may still have a shot at winning a prize, so stick around! After the awards, there will be no more major events planned, but we will still have the rooms reserved until 10 PM, and will continue playing Anime Credits until either everyone leaves or it’s 10 PM and we’ll be forced to make you leave. That’s a lot of events! Halloween Party is generally a very full day, so hopefully there’s something for everyone. 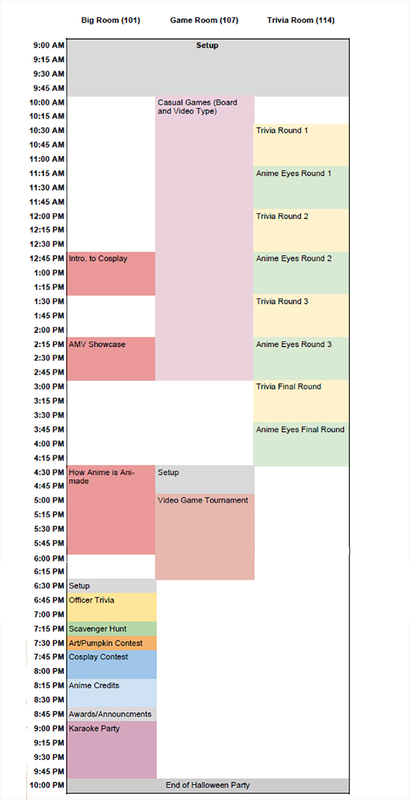 You can come all day long for the FULL ANIME EXPERIENCE or you can just come by for whatever events interest you. While prizes are only given to paid members of the club, there is no fee for entry and you do not need to be a paid member to participate in any event. This makes Halloween Party a great time to come by even if you don’t usually attend our meetings, and to invite your friends to join in on the fun. We’re looking forward to a full day of excitement and fun, and we hope to see you there! If you want to sign up for any of the events, press this link. Here is the schedule for this year. What's up, Minna! It's your Webmaster, Shawn, here to give you the rundown on our upcoming meetings. Our first Hangout meeting is today (Thursday, 9/27) from 6-10pm in the Business building in Room 114. Don't miss out on your opportunity to chill with other anime enthusiasts. You can stay for as long as you want and leave whenever you feel like you've had enough. It's a perfect chance to watch anime, play games, or do homework in the company of others. This Saturday, from 5-10pm, we'll be starting our anime viewing meetings for the year. Come on down to the Silo for the first episodes of our anime selections. At the beginning of the meeting, we'll be playing our patented Anime Eyes game, so make sure to show up on time! We will also have free pizza at dinnertime. Just like with Hangout, you can come to and leave the meeting at any time. Hope to see you there! This Sunday (tomorrow) is Club Showcase and we need volunteers to help us out at our booth. Bring any anime stuff you got!! Come to the H16 parking lot by PCV from 10:00 am to 1:00pm. 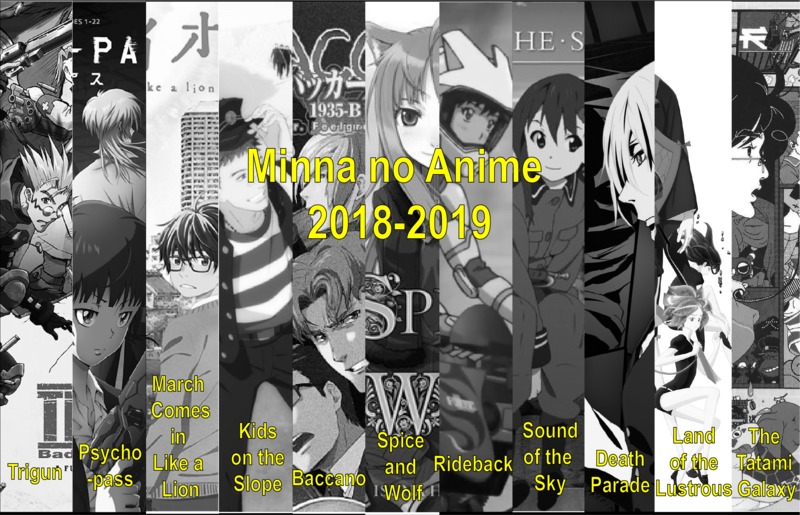 Hey old and new Minna members! This year we have another Day 0 where we will watch the first episode of shows chosen by officers. These shows are not part of our official schedule, but come anyway to meet other members and hang out!! The meeting starts at 5:10 pm in building 03 room 213 (The Silo). We hope you've had a great summer! School is fast approaching, and we have some exciting news to start the year off with. Here is our schedule for the 2018-2019 year! * These are voted on by members, and are streamed from Crunchyroll. **If, at any time, you want to just take a break, or aren't interested in what's being shown in a certain timeslot, we have a side-room where you can hang out and discuss anime with other members! We'll be meeting on Saturdays in 03-213, also known as the Buisness Silo. If you can't find it, use the Cal Poly App or got to http://maps.calpoly.edu. To learn more about previous shows we have shown over the years, check out our schedule page. I'm your webmaster, Shawn! Catch you later! !